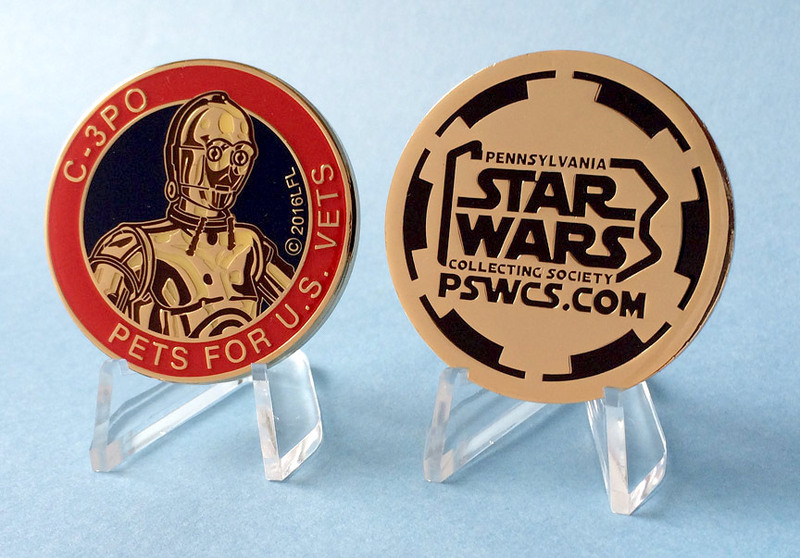 PSWCS.org and the Pennsylvania Star Wars Collecting Society are joining forces with Pets for U.S. Vets, a program of the Washington Area Humane Society in Washington, PA (EIN 25-0995781). Pets for U.S. Vets places dogs and cats with local veterans, free of charge. All animals are spayed or neutered, up-to-date on vaccinations and micro-chipped. Pets for U.S. Vets was started by Suzi Smith in 2010 and she has worked tirelessly since then to secure funding to cover the costs of the free adoptions. Now in its sixth year, the program is averaging 50 adoptions per year to veterans. 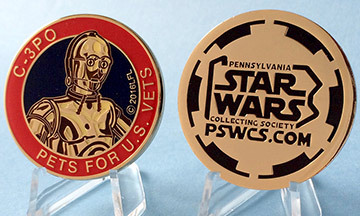 To raise funds for Pets for U.S. Vets, PSWCS.org will be selling a limited run of 1,000 medallions featuring C-3PO from Star Wars™. This will be the sixth medallion and charity that PSWCS.org has partnered with. Each medallion will be cast in gold toned metal and will feature C-3PO on the front along with the date and name of the charity, Pets for U.S. Vets. The back will have the PSWCS logo. The medallions will be sold online for $12.50 each, including shipping, for orders within the USA. International orders are acccepted with a higher shipping fee. The medallions are fully approved by Lucasfilm and will be accompanied by a Certificate of Authenticity. A receipt for your donation will also be provided as your donation is tax-deductible to the fullest extent allowed by law.